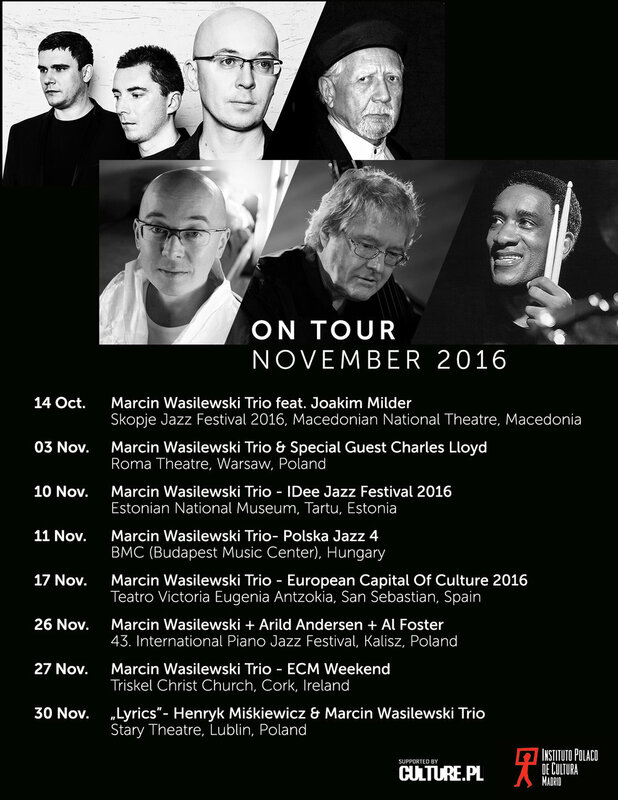 Marcin Wasilewski Trio (Marcin Wasilewski – piano, Slawomir Kurkiewicz – double bass and Michal Miskiewicz – drums) continues promoting their 4th ECM album „Spark of Life”(ECM Records/Universal Music Poland) with the impressive list of concerts in the European cities. 14th October MWTrio (with Their Swedish friend Joakim Milder) will perform at the 35th Skopje Jazz Festival (in Macedonia). Throughout its history the festival has hosted prominent names from the jazz world. The concert is supported by the Adam Mickiewicz Institute (Culture.pl) and Mr. Jacek Multanowski, the Polish Ambassador to the Republic Of Macedonia in Skopje. Few weeks after Skopje Jazz festival MWTrio will perform with Charles Lloyd as Special Guest at the ROMA Theatre in Warsaw. This will be the only concert in Poland with the legendary master of saxophone and jazz. On the 10th November Trio will visit Tartu in Estonia for the IDee Jazz Festival to perform at the ultramodern National Museum of Estonia. One day later, 11th November Trio will be hosted by the Budapest Music Center (BMC) with the support of the Polish Institute in Budapest to celebrate 105 years on the Poland’s Independence Day. MWTrio will have a great privilage to be the only Polish jazz band to perform during San Sebastian- European Capital of Culture 2016. This concert will be held in a majestic Victoria Eugenia Antzokia Theatre. Concert in San Sebastian is supported by the Polish Cultural Institute in Madrid. A week later (26. November) at the 43. International Piano Jazz Festival in Kalisz (Poland) Marcin Wasilewski will join Arild Andersen, the Norwegian double- bass star, and another legend- Al Foster on drums, the American drums’ giant, long time friend of Miles Davis and member of his bands, the Artist who played with all biggest stars in jazz and the drummer with whom every big stars of jazz had to and wanted to paly with. To finish November 2016 Tour MWTrio will perform 27. November at the ECM Weekend in Cork (Ireland) and- when return to Poland- with the concert in Lublin to play with Henryk Miśkiewicz the material from the album „Lyrics”, awarded with Fryderyk 2001 for the Album Of The Year in jazz. The tour is a part of „Spark Of Life” album promotion. Just six weeks after release has reached the Gold Album status, and few months later has received most of the jazz awards in 2014 in Poland: Album of the Year, Acoustic Band of the Year in yearly readers poll of JAZZ FORUM Magazine, two “Polish Grammy” – the Fryderyk Award for Jazz Album of the Year. The leader Marcin Wasilewski received his eighth Fryderyk Award in Jazz Artist of the Year category.